Kathi Lynn Austin (right) has been voted Arms Control Person of the Year. Austin is one of the world's leading authorities on trafficking in small arms; she has been following the arms trade and its destructive impact on conflicts around the world. (credit for photo by Brandon Joseph Baker of the San Francisco Bay Guardian) Currently, she is the Executive Director of the Conflict Awareness Project, an international nongovernmental organization founded in 2009. She has worked as an expert for a range of human rights NGOs as well as the United Nations. Most recently, Austin reported on the federal criminal trial of notorious arms trafficker Viktor Bout, who was convicted in December, for the CNN Global Public Square Blog and was featured in the accompanying in-depth CNN piece found here. Austin is gearing up for the important Arms Trade Treaty Conference to be held July 2 to 27 at the United Nations. It promises to be a rare opportunity to negotiate finally an international arms trade treaty with some teeth in it. 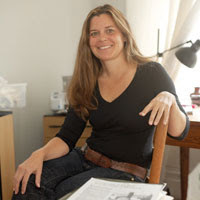 Follow Austin on Twitter @KathiLynnAustin for an excellent and instant connection to the news and activities of those fighting illicit arms trafficking.